I know it has been a long time since I updated you on the progress of the waste vegetable oil project vehicle, but that has been for a few very good reasons. The most important reason is the fact that we wanted to make sure that the vehicle we started with was is good shape or the entire project would be compromised. 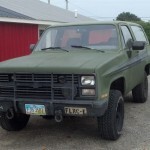 So meticulous care was taken to make sure that the vehicle, a 1985 Chevrolet K5 Military Blazer was mechanically sound. Jerry Faber was called upon to carry out that task, his knowledge as a General Motors certified mechanic is supplemented with his knowledge gathered in the reserves as a mechanic on this very style of vehicle. Jerry was allowed to use this as a fill in project, becoming almost a fixture at his garage in Fostoria Ohio. 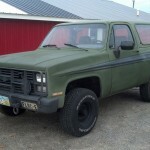 Because of the flexibility of using this as a fill in project, Jerry would provide a lower cost on the labor and also dig a little deeper into the vehicle to insure the mechanical safety of almost a 30 year old vehicle. You can imagine my excitement when Jerry called to say that the vehicle was complete and ready for pickup. Since that time I have driven the Blazer for several days for a total of a couple of hundred miles without incident. The 6.2 liter diesel starts with little effort, rattling as most older diesel engines do. The sound is almost melodious to me. So now that the mechanical details are proven, next we are on to the aesthetics of the vehicle. Or as my Wife has stated many times, the vehicle has to look pretty. I smile every time she makes that statement, it amuses me that a military vehicle and pretty would be used in the same sentence but I understand what she means. The vehicle will receive a fresh coat of paint in OD green to remove the Starsky and Hutch stripe on the vehicle, who knows how that got on a military vehicle. Then on to new rubber seals for the glass, new seats, and a few improvements to the interior such as a new coat of paint for the door panels. Finally we will add the waste vegetable oil kit, by that time I will have gathered enough driving miles to create a base line set of data for the vehicle to compare against the waste vegetable oil driving. The vehicle has little frills to start with, roll up windows, no air conditioning, no cruise control, just a good solid vehicle that should run another 30 years with good maintenance. I give you another update as we move along with making the vehicle “pretty”.